For this reason, while “Black Panther” may not be a strong movie, it certainly is an important one. Ryan Coogler’s newest film and the eighteenth installment in Marvel’s ever expanding cinematic universe, “Black Panther,” follows newly crowned King T’Challa (Chadwick Boseman, “42”) as he manages several emerging crises afflicting his nation — the highly futuristic and secretive Wakanda. Wakanda is visually marvelous. Coogler has envisioned an afrofuturist utopia fundamentally unlike any other portrayed in Western media. Wakanda is adorned in color, littered with skyscrapers tracing idiosyncratic lines in the sky. Warriors wear bright blues and reds and the cityscape is thoroughly integrated into the beautiful African landscape that composes its borders. Fearsome women rank among the nation’s officials, evoking a matriarchal order. The existence of Coogler’s utopia is bittersweet, both for many viewers and characters in the story. Wakanda represents the possibility of a future that black communities around the world were robbed of so many centuries ago. Still, it is truly wonderful to see such a world on screen, widely distributed for all to see and to marvel at. Even the characters within the story, some of whom grew up in American ghettos, break down at the sight of Wakanda, for it is the kind of dream that many black individuals have never been able to see realized. Unfortunately, the creativity and tender reverence that brought Wakanda to fruition on screen fails to elevate the rest of “Black Panther.” To his credit, Coogler establishes many incisive, topical ideas on race to pursue throughout the film. However, by the second act, nearly all of these thought-provoking threads are abandoned to tread upon Marvel’s formulaic beaten path. Taking place in the aftermath of “Captain America: Civil War,” T’Challa has just been crowned King of Wakanda and is tracking down Vibranium — the rare metal that powers Wakanda — stolen by Ulysses Klaue (Andy Serkis, “Lord of the Rings: Fellowship of the Ring”). In the process, T’Challa finds himself debating whether or not to maintain Wakanda’s neutrality in the modern, globalized world. To the outside world, Wakanda is simply another third world African nation, and this deception has protected Wakanda, its people and its revolutionary technologies from abuse by the outside world. 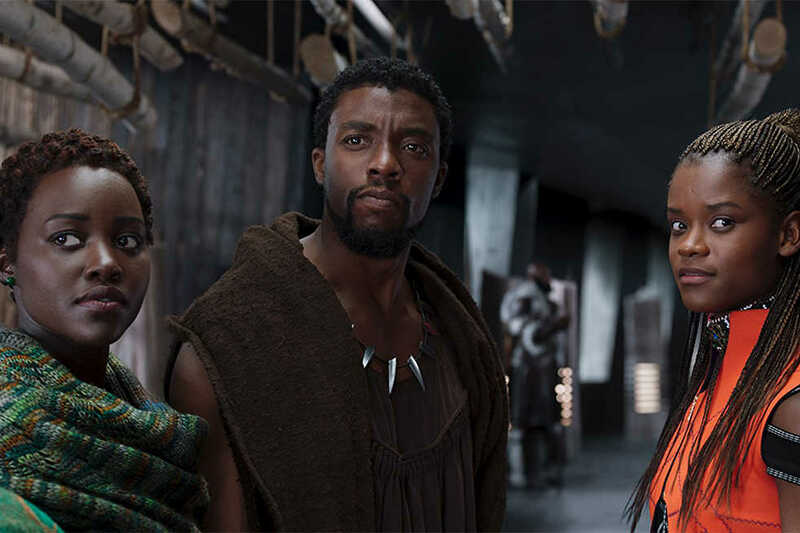 Yet now, many of T’Challa’s advisors, like his love interest Nakia (Lupita Nyong’o, “12 Years a Slave”), wish to see Wakanda’s resources levied to provide humanitarian aid to Black populations suffering worldwide. As a fundamental conflict, this is an interesting debate to be had: it is between Wakanda’s responsibility to its own people and its responsibility to the black community at large. As if on cue, however, this discussion is dropped as T’Challa is removed from the throne by Erik “Killmonger” Stevens (Michael B. Jordan, “Fruitvale Station”). Stevens is the orphan son of T’Challa’s uncle. Born impoverished in Oakland, Stevens saw his father murdered by T’Challa’s father for aiding a violent robbery of Wakandan vibranium by Ulysses Klaue. Stevens’ father did so because he believed Wakandan technology needed to be distributed to underprivileged Black populations. Likewise, after training himself to become a ruthless JSOC operative, Stevens lands at Wakanda’s doorstep to usurp T’Challa and distribute Wakandan weaponry to black populations worldwide. In doing so, he seeks to stage a violent global revolution and establish a new world order with Wakanda as the ruling nation. In Stevens’s world, black populations would be the oppressors, and all other people would live under Wakanda’s boot. Though Stevens as a character appears to be racially motivated, perhaps providing some commentary on the state of racial relations worldwide, he is really just another Marvel villain hellbent on revenge for a family member’s death. Coogler has made Stevens unmistakably evil, and in doing so, he has defanged any truly insightful commentary he could have presented in this movie.. There is no debate between letting black populations suffer or letting everyone except black populations suffer. Neither option will solve any of the world’s problems and neither represents a reasonable choice to even consider. Yet, Stevens’s character presents this false dilemma to T’Challa, and it is unfortunately inane. resolved with fists and seldom little else. Throughout, there are intermittent scenes of beauty and cringeworthy visuals. Coogler’s cinematographer, Rachel Morrison (“Mudbound”), is able to capture the landscapes around Wakanda with a stunning crispness. But for every such scene, there are scenes that look like they belong in a car commercial, and there are still others that look shamelessly green screened. Still, Boseman, Jordan and Nyong’O all offer sincere performances that can almost humanize the superficial commentary Coogler offers through the movie. Serkis as Klaue is a joy to watch as he cackles his way around the screen, wreaking havoc wherever he can. Coogler’s fight scenes are also a marked improvement over typical Marvel fare. Many fights are filmed in longer takes, utilizing practical effects over CGI to lend a kinetic, tightness to each punch and kick, immersing viewers in every blow. Ultimately, “Black Panther” is an uneven movie but admirable in its vision. Much of the praise it has received for the world it has built and the representation of an unabashedly black culture are well-deserved. Unfortunately, Coogler seems content to limit his ambitions there. The rest of the film does little to distinguish itself from Marvel’s other installments, making “Black Panther” a regrettable waste of potential.